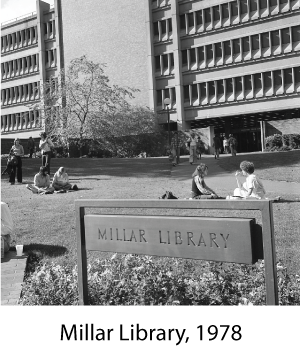 The Portland State Library had already been relocated twice when it was divided in 1968. It had outgrown its original Smith Memorial Center location, but the new Millar Library split services into two buildings: public access in Library West on the Park Blocks and technical services in Library East in Smith. After forty-five years on both sides of the park, a building expansion that changed the library’s size, shape, and look, and numerous remodels to both buildings, PSU Library is again housed under one roof in 2013. This photographic exhibit showed the phases and historic highlights of the library’s physical transitions between 1946 and the present day.